I like a good DIY challenge. So when Jen asked if the J. Crew OGJM Hyacinth Necklace was DIY-able, I gave it a shot. Don't be scared off by crochet, there are no hard maneuvers in this tutorial. The crescent is created with a series of repeated stitches. 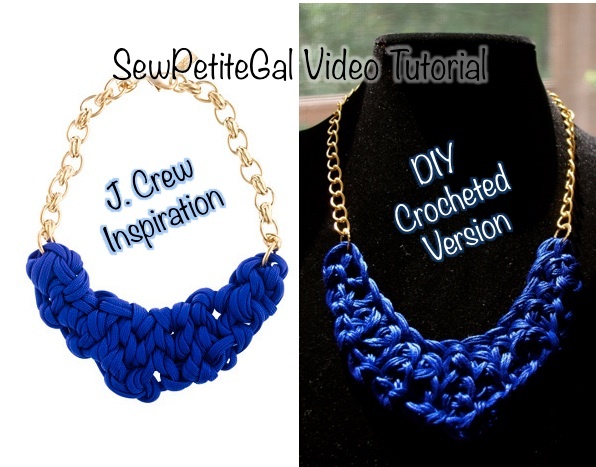 Want a more dramatic / thicker necklace? Just increase the # of loops added. Jen had also asked if this could be made by hand. Technically, yes, but it looked horrendous when I tried. Kelly found this tutorial if you'd like to try it by hand. Yay or nay on these colorful necklaces? I find crochet so much easier than knitting! Great great great great video and YOU ARE A GENIUS! I LOVE THE COLORS!!!!! OMG, the possibilities! I'm pinning this!!!!!!!!!!!!!!!!!!! Thanks for the tutorial. I have some left over embroidery thread so I might whip one up. I haven't crochet since elementary. It may be time to start crocheting again. I like your DIY version more than J.Crew. thats neat! The last time i did this was in summer holidays i think about 10 years ago!! Love it. I am tempted to try it. This necklace is not my taste and even judging by the photos, even I prefer your version to the J. Crew version. There is just no end to your creativity. I can't wait to see what you come up with next! you should totally sell these!! they are soo adorable!! LOL, you crack me up, Aubrey! i been meaning to tell you, i adore the map peplum skirt!! OMG, I actually love your versions way better than the J.Crew necklace!!! That's awesome! This looks so fun! Great post SPG!!! WOW! I like your necklace better than the one from J.Crew. I think the way you made it is more neat and intricate. You did a beautiful job, and I love the skirt you made for Jean! omg definitely a YAY for sureeee!!!! i need to do this when I have time, i love it and I love how cheap it is to make too! thanks for sharing!